Tempers flared and eventually boiled over Thursday in Detroit, as the Yankees and Tigers engaged in one of the more intense benches-clearing brawls in recent memory. Things got started when Gary Sanchez hit a home run off Detroit starter Michael Fulmer in the fourth inning. One inning later, Fulmer plunked Sanchez with a 96 mph fastball, prompting Sanchez to glare at Fulmer as he made his way to first base. Things heated up even more in the bottom of the 6th. With Miguel Cabrera at the plate, Yankees reliever Tommy Kahnle threw a pitch that sailed behind Cabrera’s back. Kahnle was immediately ejected, which enraged Yankees manager Joe Girardi, who was also ejected. Recently demoted closer Aroldis Chapman was summoned to replace Kahnle. But before the at-bat could resume, Cabrera found himself exchanging words with Yankees catcher Austin Romine. When Romine removed his mask as the conversation intensified, Cabrera pushed Romine with two hands and immediately threw up his fists in a boxing pose. Cabrera then landed a couple punches on Romine before the catcher was able to get a hold of Cabrera and force him to the ground. After that, chaos erupted on the field with both benches clearing. When things finally calmed down, both Cabrera and Romine were ejected. Romine was furious after learning he had been ejected. He tried to convince the umpire that he was merely acting in self-defense. But his words fell on deaf ears. 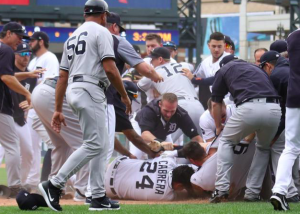 Unfortunately, the brawl started by Cabrera and Romine did little to solve the issues between the two sides. The bottom of the 7th inning began with Yankees reliever Dellin Betances hitting Tigers catcher James McCann in the head with a pitch. A livid Brad Ausmus emerged from the dugout and convinced the umpire crew to consult with one another. The crew ultimately decided to eject Betances. Yankees bench coach Rob Thomson, who had taken over managerial duties for Girardi, was irate and ultimately got himself ejected as well. There was one final incident between the teams in the 8th inning. Detroit reliever Alex Wilson plunked Todd Frazier in the leg. Both Wilson and Ausmus were ejected as a result. Benches once again cleared, but no punches were thrown, as cooler heads prevailed. When the two teams were actually able to play baseball like civil adults, the Tigers ended up winning the game 10-6. Wilson, despite his ejection, was the winning pitcher, while Betances took the loss. Thursday’s bad blood appears to have originated last month when Kahnle hit Tigers outfielder Mikie Mahtook in the head, albeit unintentionally. Coincidentally, Fulmer started that game for the Tigers and responded by hitting Jacoby Ellsbury the following inning. Both teams received a warning, but there were no further issues between the two teams until Fulmer hit Sanchez on Thursday. The only question that remains is if any suspensions will follow the players or managers who were ejected. It’s also possible that tape of the brawl could reveal bad behavior that warrants a suspension. Any players lost to suspension would be meaningless for the Tigers at this point. However, with the Yankees fighting to regain first place in the AL East and hold onto their wild card spot, they can’t afford to have players miss games due to suspension. One has to think that Romine, Kahnle, and Betances are all vulnerable to being suspended by Major League Baseball.